Since 2011, a rail network spanning more than 10,000km has linked Chongqing, the world’s largest industrial metropolis, with almost 30 million inhabitants, and Duisburg, the world’s largest inland port in the heart of central Europe. This route has proven itself to be a precursor for long-term growth in the exchange of goods between Asia and Europe. In China, the land bridge is celebrated as ‘the new Silk Road’. Behind this concept lies a comprehensive strategy with the name of ‘One Belt, One Road’. It has been connecting destinations for the establishment of an intercontinental infrastructure network between Europe and China since 2013, and refers to the geographic area of the historic Silk Road. The project comprises both land and sea routes, and outlines six corridors that are to be developed gradually. Financing is provided through the Silk Road Fund and the Asian Infrastructure Investment Bank. The total cost of the project is estimated at $1.1trn, making it is the world’s most ambitious and expensive infrastructure project since the US Marshall Plan following the end of the Second World War. An unusual state visit first focused attention in both east and west on this development. 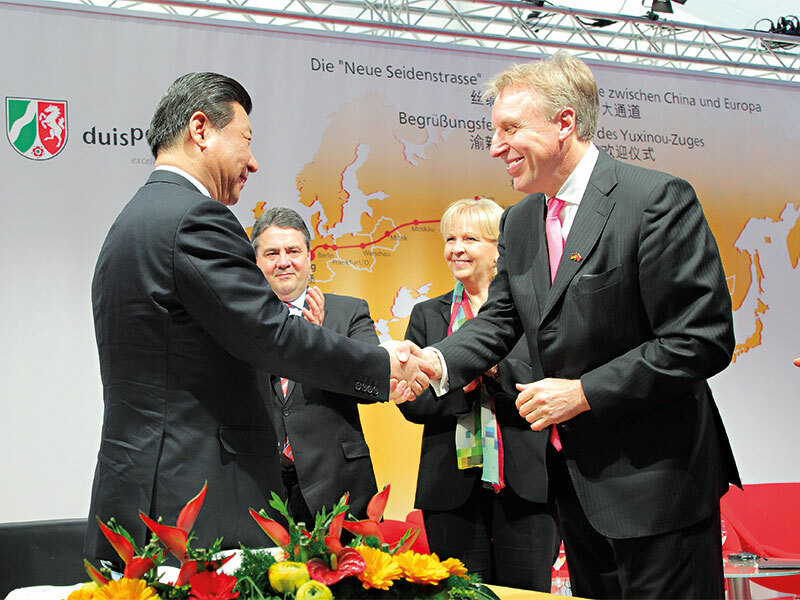 On March 29, 2014, Chinese President Xi Jinping visited the Port of Duisburg; the only industry destination on his European tour. The purpose of the visit was to emphasise the importance of the rail connection that promises faster deliveries than the sea route and cheaper deliveries than air freight, and which is supposed to open up new trade dimensions between China and Europe. The world’s attention was fully focused during the second visit. On May 13, 2017, President Xi Jinping invited high-ranking political representatives from more than 100 countries to Beijing to inform them of the gigantic infrastructure project. At the same time, he requested the creation of a joint agreement that should set out new terms of trade in connection with the Silk Road project. The general conditions are now being negotiated, but everyone understands that China, the rising superpower, intends to turn its One Belt, One Road strategy into reality. Not long ago, in 2013, only three container trains a week travelled between Chongqing, Kazakhstan and the European logistics hub of Duisburg. At the time, the trip took 16 days. Now, 25 Far East trains are processed in Duisburg every week. The travel time has been reduced to 11-12 days as a result of technical improvements. And, of course, this is not the end of the development. On the one hand, the operators currently use the traditional Trans-Siberian route for transports to and from north-eastern China. The new Silk Road, on the other hand, goes from Lodz and Brest in a south-easterly direction, and now reaches another six destinations deep in China’s central region. Overall, more than a dozen Chinese industrial centres were connected to the land bridge. In this way, rail traffic covers a wide corridor of the eastern and far eastern economic region. The Pacific Coast can also be reached in this way; from there, companies from Japan and South Korea also use the time-saving and more cost-effective transport route. The capacities of the trains that reach Duisburg (central Europe’s logistics hub) from China are well utilised. They transport mainly computers and electronic components into the middle of the EU, to 150 million potential customers. There is still some empty container space on the way to China, with its approximately 1.5 billion consumers. But here too the signs point towards growth: automotive companies, not least the German premium manufacturers Audi, VW and Mercedes-Benz, use the route, as do machine and equipment builders. And other industries – including the consumer goods industry and pharmaceutical manufacturers from central Europe – are booking ever larger contingents. Additional transport options were created for German medium-sized companies after logistics experts at DHL managed to find a way to consolidate smaller shipments in Duisburg – another opportunity to utilise improved access to the east. Meanwhile, duisport Group is also working on additional improvements on-site. They include tailored services, such as interim storage or the consolidation and packing of container contents prior to delivery to end customers. Entire systems are securely packed by specialists at duisport’s packaging logistics centre. What’s more, in the background, completely planned-through delivery chains are held available, particularly ship and train connections to 80 important European trading and industrial metropolitan areas. At the same time, the offering on the new Silk Road is continuously improved. The use of refrigerated containers on the route is attracting new customers, as are additional safety concepts. The prospect of saving costs through additional investments by partner countries in the rail infrastructure makes the new Silk Road particularly attractive. The Chinese partners are already planning further into the future. The ‘south Silk Road’ is supposed to extend to Urumqi on China’s western border. There, it meets the already proven route towards the north-west. An unusually large logistics hub is also built there over an area of 700 hectares, with the support of duisport Group’s know-how, so rail cars and containers from the two train routes can be combined or diverted as required. The south Silk Road continues through Georgia and Iran to the Bosphorus. There, it meets up with the southern European railway network near Istanbul. Similar to Urumqi and a large new logistics hub near Istanbul, duisport is also pursuing strategic cooperation for the large Silk Road project. Recently, duisport and Italy’s largest Adriatic port of Trieste entered into a cooperation agreement. As a result, Duisburg obtains better access to the maritime Silk Road, including markets in Greece and Turkey, while Trieste is even better connected to the railway connections of the northern Silk Road through its connection with duisport. The new transcontinental land bridges strengthen and underline duisport’s position as central Europe’s number-one logistics hub. Industry and trade in the region, and in all of Europe, will benefit from this development.